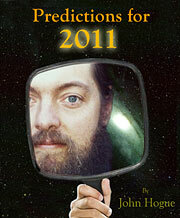 Back in March 2010, I wrote a series of blogs on Nostradamus’ weirder prophecies about animal portents. I kept that series in my blog stock, waiting for the appropriate time to release it. Articles about prophecy age like wine. The older they are, if they are accurate, the more pertinent they become when something one commented on a year ago sounds like it was written for today’s news. The new year came in with a firework “bang” in Beebe Arkansas with a whole lot of red wing blackbirds startled out of their slumbers by loud reports of fireworks sending these daylight fliers into a flocking panic in the dark, crashing into trees, power lines and houses. By morning, 3,000 dead and bleeding black birds with their scarlet and gold epauletted wings could be found thickly strewn across the town in a plumed-feathered version of a Napoleonic battlefield. The hungry media news, ever agitated by its ratings tapeworm to prey and feast on new stories, sound “byte”-bought into the “freak” of the bird deaths first, then asked adult questions later. 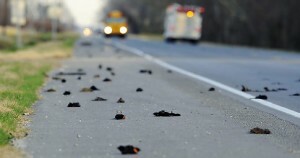 More stories came in of mass bird-battered deaths: 450 red-winged blackbirds, cowbirds, grackles and starlings littering a highway in Baton Rouge, Louisiana; coots by the dozen found dead on a Texas highway bridge. Fifty jackdaws dead in Falkoping, Sweden. Then 8,000 turtledoves come raindrop dead out of the skies in Italy, their beaks turned blue with either hypoxia or poisoning. The conspiracy cults started HAARP-ing about this or that unsubstantiated piss in the wind about why all these mass bird deaths should come in the last few weeks. It must be a secret government weapon scrambling the bird’s beaked electromagnetic sensors used to navigate sun and stars during migration. Alex Jones flummoxes about red-winged blackbirds’ insides being turned to goo. I began receiving a lot of letters from my readers asking what my take was on all of this. I examine strange phenomena patiently and objectively before I answer. As much as I have worked over the years in the paranormal and uncovered a lot of strange stuff going on, most paranormal mysteries have a “normal” solution, if one applies a cool and calmly meditative approach in examining the evidence, rather than going “goo goo” conspiratorial. The magnetic pole is shifting down into Russia about 25 miles a year and scientists are indeed voicing concern that such a gradually steady shift is disrupting the inbuilt navigational instincts of migratory birds, causing them to miscalculate when its time to fly south for the winter, etc. Once the media stopped ruffling feathers with sensational stories and theories and actually started piecing together the evidence and eye witness accounts it was found that most of these bird deaths in Arkansas, Louisiana, Sweden and Texas were not a “sign” or a divine “portent” of the coming apocalypse. They were victims of the kind of a-flock-calypse inflicted by the violent hand of man holding firework rockets, launching a blast into the sky on New Years. If coots roost under a bridge in Texas and get hit by trucks and cars, it is because humans have forced them to make wrong rookery choices because man destroys their natural habitats. The hypoxia that suffocated the turtledoves in Italy was most likely caused by violent and very cold, upper atmosphere winds carrying the birds in updrafts into high altitudes. As many of you are directly experiencing your own episodes of wild weather, huddled recently in snowed-in American, European and Russian airports, or paddling your boat down flooded streets in Queensland, Australia — or you are shoveling mudslides out of your Californian homes and businesses, — there is a lot of violent weather rocking and rolling this earth and it is killing animals as much as it can kill people in freaky ways. 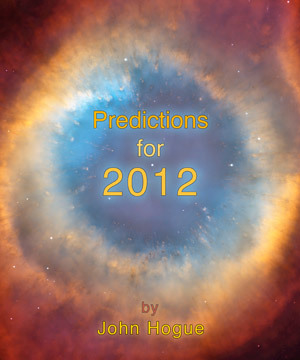 I point out in my final chapter of Predictions for 2011 entitled “Alarm Bells Sound the Unsustainable”, Mother Nature is sick. We have made her ill with our abuse of her climate, her lands, rivers, lakes and oceans. It is not surprising to me that the prophecies logged by prophets for millennia (listed in the book) about a time when the world’s oceans would rise and its skies would burn with great droughts and super-storms sound like today’s news reports. The same goes for predictions logged about mass animal deaths. These are not divine portents, these are signs of our stupidity coming home to roost or fall out of the sky dead by our poisoning and disruption of the only and fragile ecosystem we know exists to support our existence. Our only home in the universe. So, it does not surprise me that news stories slop birds dying by the thousands with slimy spots about devil crabs washed up dead along the Kent coast near Thanet, UK. Or, that we now hear about thousands of drum fish heaped and stinking along a 20-mile stretch of the Arkansas River; or that there are fish piled high on the beaches of Florida or that two million adolescent fish bloat belly up to scum Chesapeake Bay, Maryland. We have set in motion a man-made mass extinction that in a century’s time could kill off as much life on this planet as the meteor strike that obliterated the dinosaurs 65 million years ago. These die offs of fish, these freak bird deaths, are alarms sounding the unsustainable habits of humanity. The time for changing course is running short. The whims of ratings call up clusters of reports by the news media that can stack up and serialize events out of proportion. Have you ever noticed that one abducted child story, if it goes national, begets a whole bunch of lost child “amber altered” stories for about five days to a week? You would think there was a sudden rash of kidnappings when actually kidnappings are happening at a steady frequency all around the world. It only looks like a sudden flap of kidnappings because the media is exploiting it until they get distracted by another news cycle. So it is with the dead birds and fish stories. 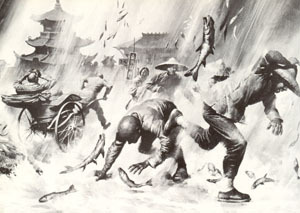 Weird animal mass deaths, or those apocalyptic, vivid stories of frogs and fishes raining on desert towns, right out of Peter Weir’s movie, The Last Wave, conjure up bouts of doomsday proselytizing. Indeed, prophets like Nostradamus often foretold oncoming disaster for humanity with visions of spectral atmospheric phenomena, and downpours of animals out of the sky. My fellow human sheeple, stop “doctoring” the climate and stop the “do little”-to-no squat to lower your flatulent winds of greenhouse gases heating up the world. Stop it now, or prepare for more “Alfred Hitchcock meets Doctor Doolittle” talk-to-the-animal falling-out-of-the-sky moments. Anticipate omens on your own driveway, like starlings seeing stars on the tarmac of Coxley, England, after a whole flock in early March 2010 inexplicably did the Stuka plunge with dive breaks broken. Your roof and backyard may play net to a similar heavenly animal portent we examine today when fish fell out of burning blue skies onto the sunburned sands of the Australian Outback. Prophets in ancient times used to tell a “tail” about tomorrow you could carp about. The divining art of Ichthyomancy studied the fishermen’s catch offered up for sacrifice. When Ichthyomancy converges like a thundercloud with Meteormancy you can try to augur what in scaly blazes was God’s message from the sky in river fish out of water falling on your head in the Aboriginal bush. Residents of a small outback-Australian town have been left speechless after fish began falling from the sky. Hundreds of spangled perch bombarded the 650 residents of Lajamanu, shocking local Christine Balmer, who was walking home when the strange ‘weather’ started. She said: ‘These fish fell in their hundreds and hundreds all over the place. The locals were running around everywhere picking them up. The fish were all alive when they hit the ground so they would have been alive when they were up there flying around the sky. ‘When I told my family, who live in another part of Australia, about the fish falling from the sky, they thought I’d lost the plot. This would be a good moment to insert Ivo’s reflections of another advent of acrobatic splatting animals out of the sky. Hello all, concerning those animals coming down “out of the sky”: it is not the first time I heard stories of that kind. The explanation given (some 20 to 30 years ago) was that these animals got trapped in a kind of weather phenomenon and “transported” and “released” sometimes thousands of kilometers away. That for this phenomenon…what’s true… I don’t know. Nostradamus used weird fish stories as portents, one of which (Century 5 Quatrain 98) may have dated the last hothouse spike in our ascending global temperature. Bearn, Bigorre (Southwest France) in distress from fire in the sky. The sun ends its transit of Cancer every year around 22 July. At the height of some future summer, Nostradamus’ eye into tomorrow affixes itself to portents of hot and bothered fish along the Atlantic coast in the extreme southwest corner of France. Nostradamus perhaps more than any other prophet was obsessed with maps and geography. No prophet describes in more detail the locations of his future dramas. Nostradamus did not mention the creation of vertical lines or longitudes — unless I have overlooked the prophecy. Galileo proposed them in 1612. The British Board of Longitudes established in 1714 sought to pay any bright eyed and astrolabe-able inventor to hatch a longitudinal system. Finally, John Harrison’s work on chronometers in 1773 made longitude plotting possible at sea. Nostradamus’ storehouse of maps in his secret study sans-longitude often navigate the seer to the locale of his vision using inaccurate horizontal latitude lines drawn on 16th-century maps. If he meant to plot this portent on a future drought along the beaches of Biarritz in Bearn, he was off by 4.5 degrees. Bearn is a located at latitude 43.5. However, if you draw a line across the Northern Hemisphere along latitude 48 you burn a path of a drought blazing sun across all the world’s most fruitful grain belts. The prophecy is not only about Biarritz but warns of a future we must avoid when amber oceans of wheat stretching across North America, Europe and Russia revert to prairies and inhospitable steppes in the first half of this new century while fish are hopping mad off Biarritz over warming ocean habitat. 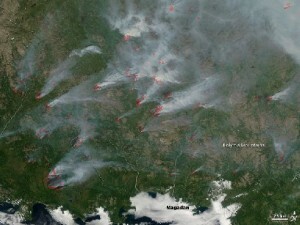 Right: Russian fires seen from space (NASA). Sometimes the indexing of Nostradamus’ prophecies appears to match significant months and years as if they are hinting a date. For instance, I have often given the example of Century 5, Quatrain 45 speaking of a great empire falling: pres d’arduenne silue — or, through the Ardennes forest. This not only covers the French colonial empire’s collapse when Nazi Germany invaded France in 1940 through a surprise panzer attack out of that very same forest in Luxembourg, but 4.5 years later another Empire fell, through the Ardennes forest: the Third Reich. Adolf Hitler squandered Germany’s last strategic reserves trying an end run a second time though the Luxembourg forests in the Battle of the Bulge. 5 Q45 stands for May 1945. We celebrate VE (Victory in Europe) Day on the fifth month of the year (19)45 because it marked the downfall and total destruction of Hitler’s empire. No matter how good an interpretation sounds, one should not shut one’s insight eye to other possibilities. The riddle of fish boiled hectic could allude to another quatrain that may describe a cosmic disaster in our future. Look out for a blog coming soon about it called, Nostradamus, Burnt Fish Offered from the Sky. Was Obama born a Kenyan and therefore not qualified to be president; or, is the Birther Movement kooky? Read what the birthers manage to have heard in Congress in the chapters entitled Wattsington D.C. and A Big GOPocalyptic Deal in Predictions for 2011. PSS–The mass shooting in Tucson, Arizona yesterday, critically wounding US Congresswoman Gabrielle Giffords along with 19 others including six fatalities presents a dire development in the political climate of the United States. One might hope that such a shocking event will temper the extremist rhetoric from the political left and right fringes and see a more moderate discourse in 2011; however, astrological configurations coming in the spring of this year indicate that Congress will fall sway to violent words and partisanship once again. I describe in detail this danger in the following chapters in Predictions for 2011: Coup d’état by Politicorp, Wattsington D.C., A Big GOPocalyptic Deal, and The Second Coming of Change We can Believe In. This entry was posted in Prophecy and tagged Adolf Hitler, aflockalypse, Alice Springs, Arkansas River, Australia, Barack Obama, Baton Rouge, Battle of the Bulge, Birther Conspiracy, Birthers, blackbirds, C5 Q45, C5 Q98, Century 5 Quatrain 45, Century 5 Quatrain 98, Chesapeake Bay, coots, Coxley, Darwin, devil crabs, drum fish, Falkoping, fireworks, fivty jackdraws, HAARP, hypoxia, Ichthyomancy, John Hogue, Kent coast near Thanet UK, Lajamanu, latitude 48, magnetic pole shift, mas bird deaths, mass animal deaths, Meteormancy, Nostradamus, Obama, Obama born in Kenya, out of the sky, Peter Weir, prediction, predictions for 2011, prophecy, red-winged blackbirds, Richard Chamberlain, rookery, Russia, sheeple, Tanami Desert, Texas, The Last Wave, Third Reich, turtledoves, VE Day. Bookmark the permalink. Post a comment or leave a trackback: Trackback URL.